Jeanniey Mullen is the Executive Vice President and Chief Marketing Officer for Zinio and VIVmag and is also the founder and Chairperson of the Email Experience Council. She is an expert in the email and online marketing world and has more than two decades of experience helping B2B and B2C clients such as IBM, Yahoo!, and American Express harness the power of a digital dialog to drive revenue, improve brand impact, and enhance customer relationships. David L. Daniels is a multichannel marketing consultant who has been the leading analyst voice shaping the email marketing industry. David currently serves as Vice President and principal analyst with Forrester Research. Prior to his role as an industry analyst, David held senior level positions at Apple, Urban Outfitters/Anthropologie, MicroWarehouse, Genesis Direct/ProTeam, and CDA Computer Sales. 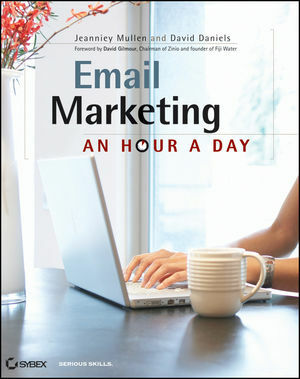 Chapter 1 Understanding Email Marketing Today. What Email Means to Your Audience. The Five Types of Email . Understanding the Economic Impact of Email. Chapter 2 The Five Critical Elements of Every Email You Create. Creating Brand Impact.Adding Intelligence to Your Design. Chapter 3 Getting Ready to Build Your Email Marketing Efforts. Aligning Your Strategy with Your Tools. Organizational Readiness: Resources Required for Success. Justification: Selling Your Boss on the Return on Investing in Email. Chapter 4 What Happens Once You Send Your Email. The Email Marketing Database and Future Multichannel Efforts. The Top Five Ways You Can Mess Things Up If You Are Not Really Careful. Key Driver 1: Email Address Acquisition. Key Driver 3: Making the Data Work. Key Driver 4: Multichannel Integration. Key Driver 5: Technology (Delivery, Deployment, and Design). Key Driver 7: Privacy/Governmental Control. Chapter 6 Preparing Your Email Marketing Strategy. Week 1: Preparing Your Resource Arsenal. Week 2: Building the Blueprint for Success. Week 3: Counting Down to “Go Time”. Week 4: Testing Your Way to the First Campaign. Chapter 7 Month 2: Ensuring Success as You Launch Your Campaign. Week 1: Sending Your First Campaign. Week 2: Creating a Plan to Optimize Your Results. Week 3: Measuring Email’s Impact on Other Channels. Week 4: Promoting Your Email Results Within Your Organization. Chapter 8 Month 3: Adding Bells and Whistles. Week 1: Using Email as a Feedback Tool. Week 2: Creating Video- and Audio-Enabled Emails. Week 3: Creating Mobile Email. Week 4: Creating Social Email. Chapter 9 Getting Ready for Year 2 and Beyond. Iterative Financial Analysis: Analytics Over Time. ESP Refresh: Evaluating Your ESP and Technology Partners. Appendix A Vendor Resource List. Delivery Service Providers and Reputation and Accreditation Management Services. Market Research, Agencies, and Consultants.